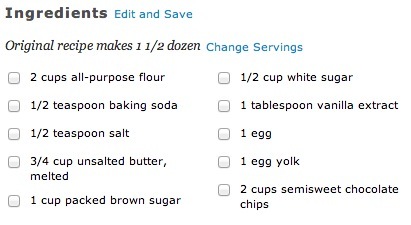 The BEST Chocolate Chip Cookies… Ever. I know that the “best” is a personal opinion. But I love these chocolate chip cookies. They’re easy to make, they’re gooey and delicious, and M loves them too! I got the recipe off allrecipes.com, my favorite spot to find new recipes, and read other people’s reviews and recommendations. In my gas oven I bake these for 17 minutes. 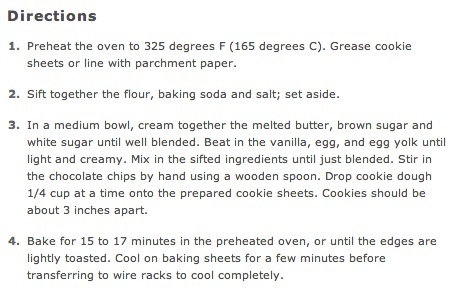 I also use a small ice cream scoop as a dough measurer, and typically end up with 30-ish cookies. So mine are smaller than the recipe calls for, but that means M is more likely to share some with me! I think the trick is to let the cookies cool on the warm baking sheet for approximately 5 minutes before removing them and placing them on the wire cooling rack. This extra step means the bottoms get cooked a little bit extra, giving them a slight crunch, and help them hold together!